Press Play understands the importance of designing systems for the lifestyles of today and preparing them for the lifestyles of tomorrow. There are many steps to the process of building a new home or building and it is crucial that the first step is a properly designed structured wiring system. A structured wiring system is more than just a random set of cables ran throughout a house or building; it is a systematically designed package which is installed by very stringent guidelines. Our structured wiring packages are designed to bring together each subsystem into one fully automated system — while accommodating upgrades. Having all wires run to the same enclosure panel allows for cleaner communication and easier maintenance. Press Play offers a choice of pre-designed or custom structured wiring packages to meet all the needs of your new project. In order to accommodate future needs, you may want to consider pre-wiring for any and every system you may like to have installed in your project. Retrofitting systems in the future can be expensive, time consuming, and sometimes impossible without tearing down the walls. 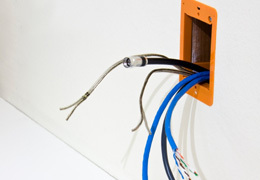 Pre-wiring a home or business allows customers to continually upgrade or add-on to the existing system.